Unlike some former presidents, Mr. Trump has taken a noticeable interest in SEC policy. In August, he asked the Commission to study switching corporate financial reporting to a biannual schedule in place of the current quarterly system. The president's favored means of communication—social media—is also a topic of concern for the SEC, as some CEOs pioneer the use of new channels of communication with investors. To find out what market observers see as the best ways to address these matters, Mergermarket on behalf of Toppan Vintage spoke with four experts. Scott Kimpel, Hunton Andrews Kurth says: I think the entire manner in which we communicate with investors is something that should be looked at. I'll credit the former SEC Chairman Mary Jo White with starting the disclosure effectiveness project, which was meant to be a top-to-bottom review of the regulatory reporting process for public companies. They looked at both the legal disclosure requirements and the accounting disclosure requirements and there was a lot of fanfare around it. There were some great staff reports written about the history of disclosure, but the actual changes that came out were much more focused. 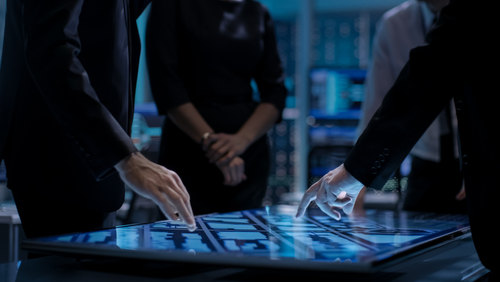 After several years of proposal and comment, the Commission not too long ago adopted the first round of changes with something called the Disclosure Simplification Release. It was really something of interest only to technical lawyers and accountants, not a fundamental rethinking of the disclosure system. The format for delivery of information is something that could be looked at. It could become a kind of live electronic database, rather than these static reports that often don't change much over time. I think doing something like that would be fascinating. Another area to consider would be broadening the use of new distribution channels, since people now get their information off their smartphones and through social media feeds in today’s world of the 24/7 news cycle. I also think the entire proxy plumbing area is one that the Commission should take up. I’m active in the blockchain world, and there are technological solutions to at least some of the proxy plumbing issues. They involve deploying distributed ledgers to replace the shareholder ledger system that we currently have – that could get us back to a place where you have instantaneous communications between buyers and sellers, as well as instantaneous clearance and settlement, which is not something we have now. What would also be interesting and appropriate is to accommodate the trading of digital securities. Overstock.com has a blockchain preferred stock that they issued a few years ago, but a lot of the clearance and settlement of that is still done through conventional means, because the existing regulations don't provide the full range of flexibility that I think is necessary to permit direct communication between buyers and sellers, and the direct recording of transactions on distributed ledgers. That's another area I think the SEC should look at. 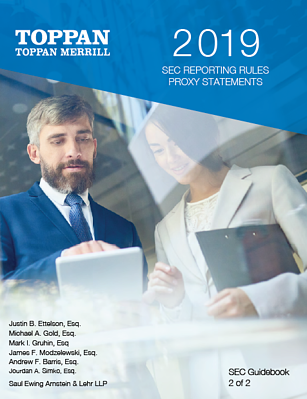 Lona Nallengara, Shearman & Sterling adds: Corporate governance is not entirely within the scope of the SEC’s mandate, so there is a real challenge to identify what would be appropriate for the SEC to address through changes in disclosure or other requirements. By and large, the Commission has approached these corporate governance questions by creating disclosure requirements, such as disclosure of a company’s policy on diversity, rather than a mandating a particular action. Key issues in corporate governance right now include board diversity, board oversight over environmental matters, broader social policy issues, and cybersecurity and data privacy questions. Changes in the specific disclosure requirements in these areas could come, but what is more likely, and what we have seen with so many governance issues over the last number of years, is that private ordering will be the strongest catalyst for change. Institutional investors and other advocates will put pressure on companies to address the issues that are important to them – topics like board diversity issues, pay equity and cybersecurity and data privacy. So, like we saw with the broad adoption of proxy access through advocacy and private ordering, a rule change from the SEC will not be the biggest driver of governance changes for public companies – the advocacy of shareholders will. Bill Ide, The Conference Board Governance Center weighs in: A critical area I see for SEC continued focus is getting the public markets back to fulfilling their mission of job creation and GDP growth. The fact that public markets are shrinking is a major concern. Long-termism is clearly the key issue – moving the public markets away from speculation and toward a place where markets are all about value creation is critical. It is imperative that boards and long-term investors align on requiring and then supporting a company’s long-term strategy. The Common Sense Principles recently signed by CEOs of major public companies and index fund CEOs provides the needed road map for long-termism. Now, the index funds and the big pension funds must “walk the talk.” While they are saying the right things for long-termism, they also have investments in activist hedge funds, and you can’t have it both ways. Hopefully the Common Sense Principles will provide the forward guidance to assure the restoration of the public markets to their critical role in creating prosperity for our economy. 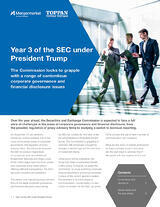 Over the year ahead, the Securities and Exchange Commission is expected to face a full slate of challenges related to corporate governance and financial disclosure. In particular, the Commission will be reviewing the possible regulation of proxy advisory firms and studying a switch to biannual reporting, among other issues. To find out what market observers see as the best ways to address these matters, download our full report. 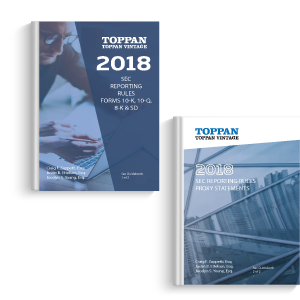 Toppan Merrill, a leader in financial printing and communication solutions, is part of the Toppan Printing Co., Ltd., the world's leading printing group, headquartered in Tokyo with approximately US$14 billion in annual sales. Toppan Merrill has been a pioneer and trusted partner to the financial, legal and corporate communities for five decades, providing secure, innovative solutions to complex content and communications requirements. Through proactive partnerships, unparalleled expertise, continuous innovation and unmatched service, Toppan Merrill delivers a hassle-free experience for mission-critical content for capital markets transactions, financial reporting and regulatory disclosure filings, and marketing and communications solutions for regulated and non-regulated industries. 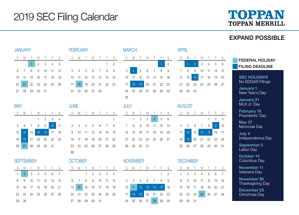 With global expertise in major capital markets, Toppan Merrill delivers unmatched service around the world. 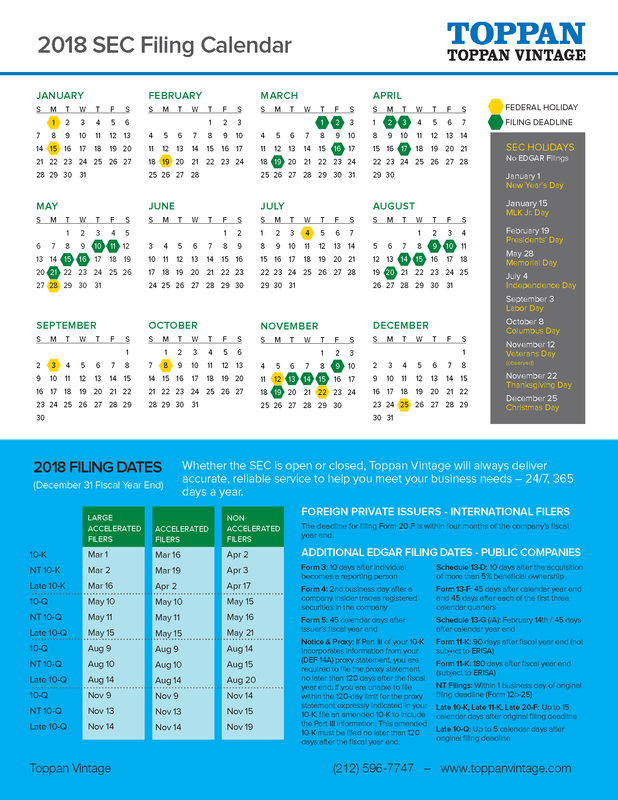 Download the 2018 SEC Filing Calendar here. 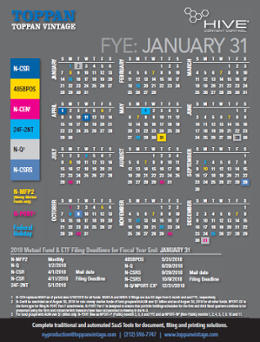 Download the 2018 Mutual Fund & ETF Filing Dates here.